Pro-Choice Rally Turns Raucous | News and Features | Style Weekly - Richmond, VA local news, arts, and events. 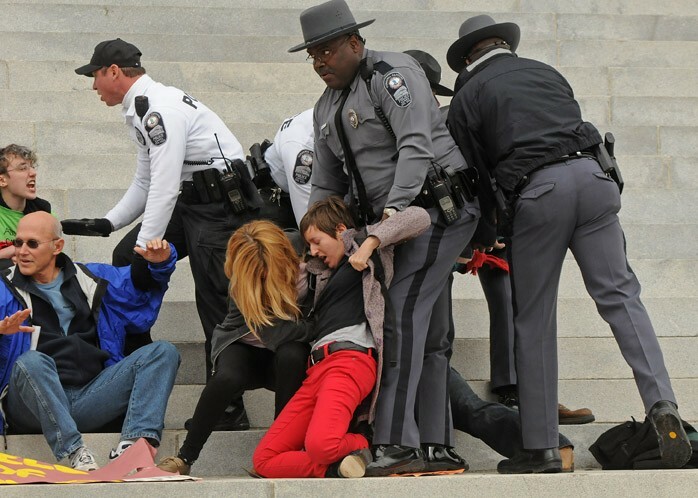 State Police descend on state Capitol, arrest dozens of protestors. Read our cover story on the women's rights protest arrests here. See photos from the protest arrests on our Facebook page. See photos from the "Speak Loudly With Silence" rally at the state capitol. About a thousand women’s rights protestors descended on the state Capitol Saturday afternoon to protest anti-abortion legislation in the General Assembly, and then things got ugly. 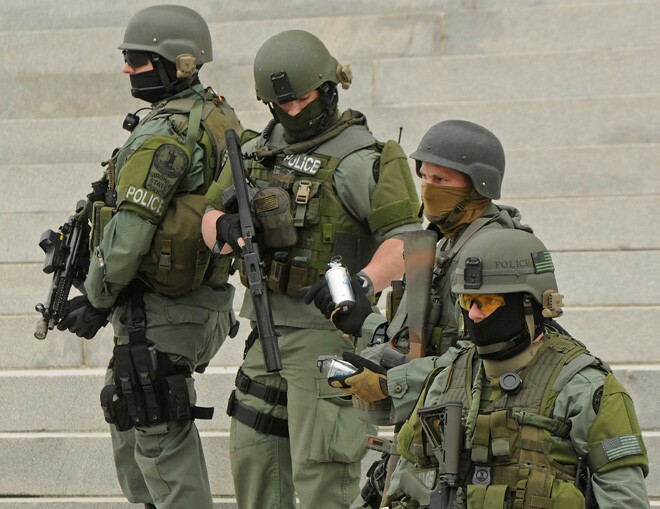 About 20 State Police officers, many in swat gear with face shields and body armor, were called in to assist Capitol Police in controlling the crowd. Some of the State Police officers wore green camouflage and carried rifles and canisters of tear gas (no tear gas was used, however). After being warned to vacate the south steps of the Capitol, police officers arrested 31 people -- 14 men and 17 women -- on charges ranging from unlawful assembly to trespassing, according to Capitol Police. 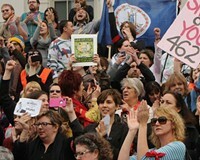 The rally ended a raucous two weeks in the statehouse, with anti-abortion legislation generating national headlines in a Republican-controlled General Assembly. While legislation granting unborn children “personhood” status was shelved until next year and a bill requiring invasive, transvaginal ultrasounds prior to abortions was watered down at the request of Gov. Bob McDonnell, women’s rights protestors descended onto Capitol Square nonetheless. Organizers for the event, Speak Loudly With Silence, say that an estimated 1,000 people participated in the rally, which also involved members of the Occupy Richmond movement. 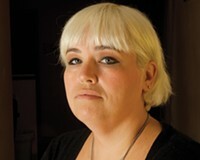 Claire Tuite says that the arrests were not planned. When the protestors emerged on the Capitol, some made an "autonomous decision" to "occupy" the steps of the Capitol building. "This was a peaceful protest on taxpayer-funded property," Tuite says. "We have every right to be here." Josh Kadrich, one of the organizers, says a small group broke off from the larger crowd of protestors, determined to make it to the steps. They blew by the cops standing on the steps leading towards the capitol. Others joined in. "Eventually, there were around 400 people sitting on the steps of the capitol in silence to protect women's rights," Kadrich says. Then State Police, many officers in riot gear, showed up. The protestors were asked to leave and given a countdown as to when the police would begin making arrests. Some complied peacefully. Others locked arms and resisted. Molly Vice, press liaison for the group, says the arrests "shames lawmakers for passing regressive legislation that usurps the good judgment of women on their own health care for the state's. "It's an outrage," she says of the ultrasound bill. "We're here ... to tell truth to power that infringing on women's health is not okay. Not this year or the next." Earlier this week, the amended ultrasound bill -- now requiring abdominal ultrasounds -- passed both the state Senate and House of Delegates, and now awaits the governor’s signature. For more photos from the rally, visit Style's facebook page. How Shelley Abrams and a band of activists are reframing Virginia's debate over abortion. The nomadic political movement returns after a hiatus — and finds a purpose in Virginia women's rights. Gov. 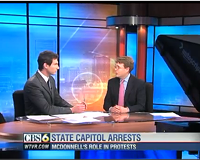 Bob McDonnell spokesman responds to Saturday's women's-rights demonstration at State Capitol.